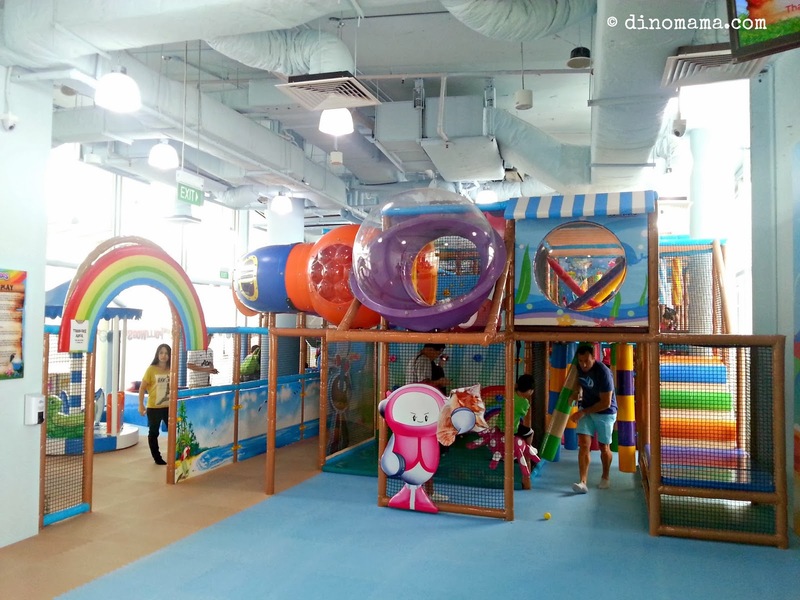 The Polliwogs opened their third play centre @ VivoCity in December 2013 and we were invited to have a first hand experience in this new place earlier this month. Even though I was still feeling a little bit under the weather I decided to attend the event as DinoBoy fell in love with The Polliwogs after our first visit to their Robertson Walk play centre in October 2012. When I entered The Polliwogs I immediately like it a lot because the place is so bright and cheerful! Located at the rooftop sky park, the 5000 square feet area enjoys natural lighting from the sun beaming in which instantly light up the place. This made the rainbow colored climbing structure looks very inviting, the minute DinoBoy saw it, he squealed with excitement and made a beeline for it. The area is divided into 2 sections, on 1 side its the play area while on the other side its the cafe and the function rooms. 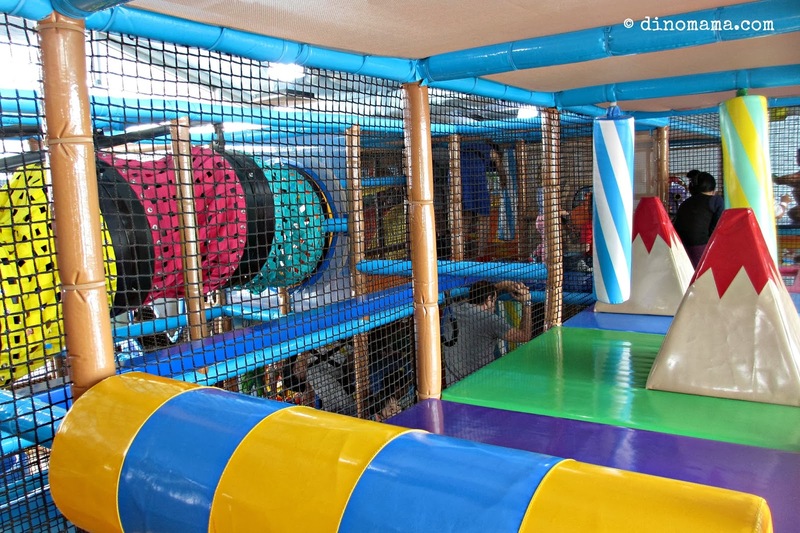 You can plan to hold your child's birthday party at The Polliwogs too. They offer a few theme parties so simply just choose a theme and they will handle the rest. However, not all centres have all the theme parties available, you have to call up the respective centres to check on that. 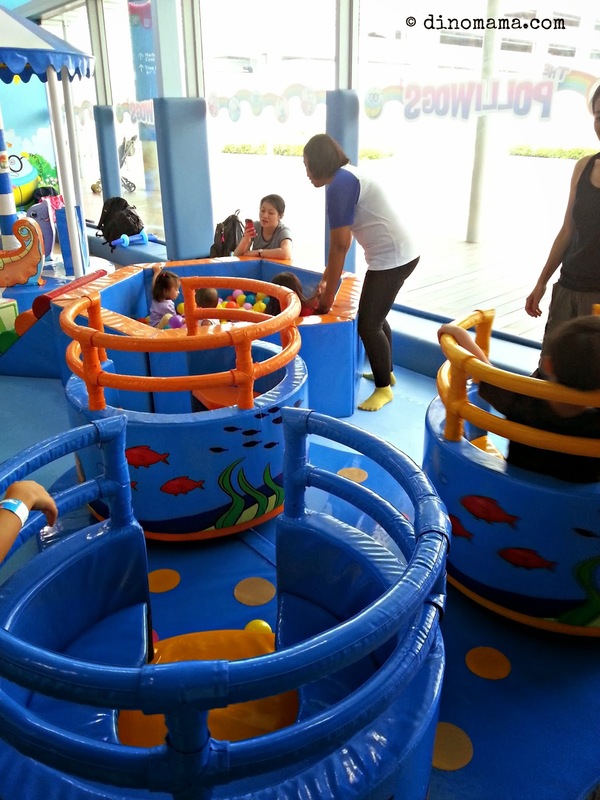 If you are sitting at the cozy toddler area while your toddler is having a blast of time in the ball pit or exploring the area, you can relax a little bit by watching the boats/ferries going by in the sea or the monorail going to & fro Sentosa. I couldn't resist and climbed into the maze too! It is a different world up there with obstacles to crawl over and I simply adores the vibrant colors! I would have crawled around trying to chase after DinoBoy but my bones are too old for that, the knees were screaming in protest after a short while. Psst! 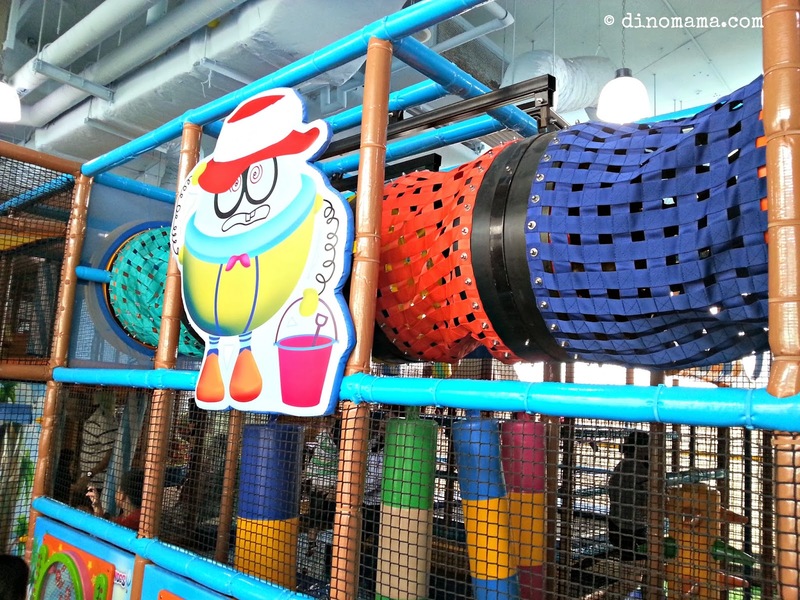 There are giant wave slides somewhere in the maze too~ I am sure they will be a hit with the kids. They also have a small rock climbing padded wall! DinoBoy tried to climbed up but didn't made it far up as he was a little bit afraid. Thanks to Mama Sue who showed him & Dumpling by climbing up with ease *Great Job Mama Sue! * DinoBoy follwed her and managed to reach the top! The wall is not very big so it only allows 2 kids to climb comfortably at the same time. DinoBoy clearly had a blast of time, he has even forgotten about this sick Mama sitting at a corner trying not to fall asleep from the medication. He only emerges from the maze some 30mins later when he felt thirsty and needed a drink badly. And when he was not going round and round in the maze with Dumpling, he was pretending to be a dinosaur (just coz he was wearing socks with dinosaur feet print on it) with fierce loud "ROARRRR!!!" and chasing after her. Now here is a good news which I think most parents will like. 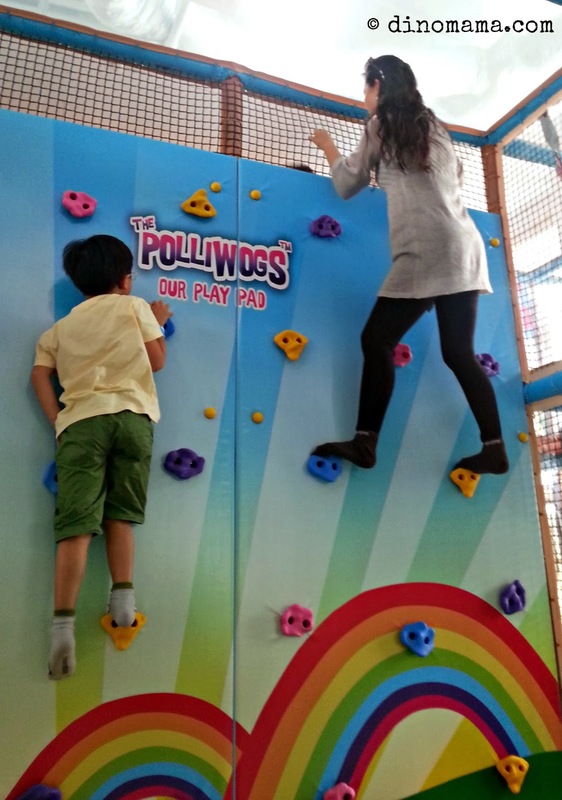 The Polliwogs @ VivoCity has drop off service @ additional SGD15 per hour (means you pay entrance fee + drop off service fee) you can let your kids have some fun while you shop at VivoCity at ease. - the staff and child ration is 1 : 5 and there will always be at least 2 staffs around the climbing area supervising the kids. - your child must be toilet trained. - your child must not have any medical condition. - If your child is hungry he can eat at the cafe and you settle the bill when you pick up your child. 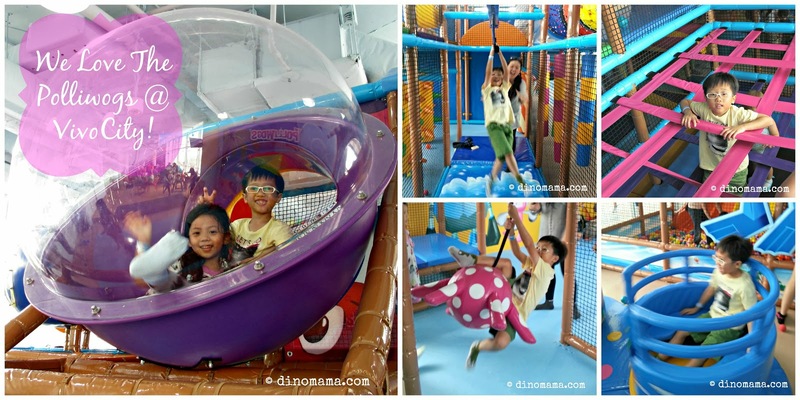 Come check out The Polliwogs @ VivoCity or the Big Playground as DinoBoy called it, soon! 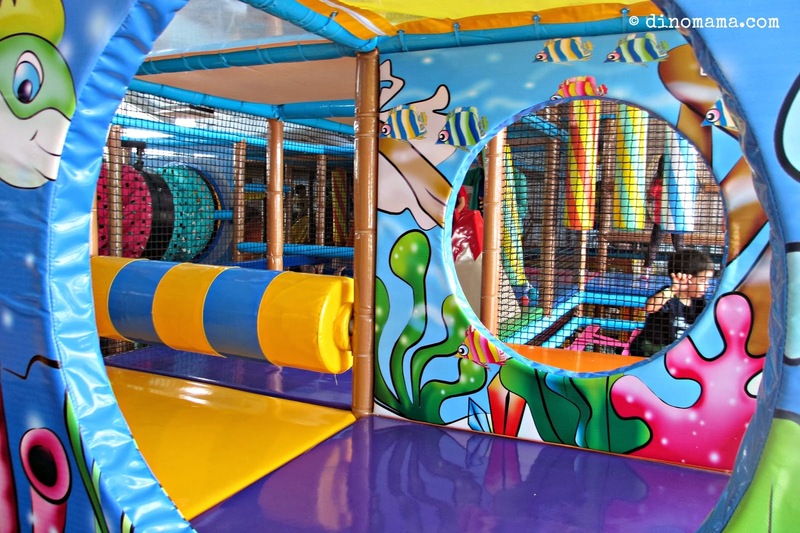 I guarantee that you and your child will have a great time there! Please note that socks are required at all time in the play centres. Thanks for this review! I am deciding if I should opt for this for my gal's 6th birthday this year!